Hector Bellerin says he is continually amazed by the quality of "born champion" Mesut Ozil, who inspired Arsenal's win over Leicester City on Monday. 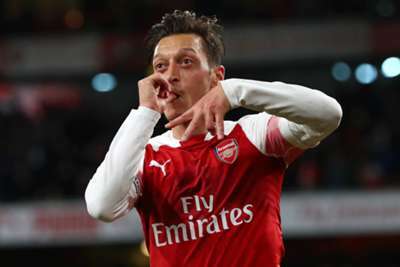 Ozil scored the Gunners' equaliser at Emirates Stadium before playing key roles in two sublime team moves that ended with Pierre-Emerick Aubameyang finding the net to secure a 3-1 victory. The 30-year-old, who was captain for the match, became the top-scoring German in Premier League history with his 30th goal in the competition to help his side battle back from Bellerin's first-half own goal. "Mesut is a player that always keeps giving his best and is always surprising everyone and he's a player that we're very grateful and very lucky to have," said Bellerin. "When the team play well with good football and he can find space he's always a killer with his passes and finishes, so for us to have a player like him in the team is very important." When asked whether his jaw ever drops while watching Ozil, he replied: "It is like that! It's like that in training and it's like that game by game. It's always a blessing to have players like that but the work comes from the whole team and it comes from the back from the goalkeeper to the striker. We're all one and when you have players with such quality it's always that little bit easier. "Mesut is a player that has been through a lot in his career through loads of ups and downs, but most of all he's a born champion and he's a player who has so many records in the world of football, so he's a player that is an example for everyone. Everyone wants to have the success that he's had on and off the pitch, so for us to have someone like him as a captain is really important."